Instructions: Use your mouse to aim and left click to fire your weapon. 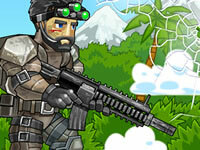 You are an elite soldier, you should complete all missions by killing all your enemies. Upgrade your skill and weapons to be destroy everything around you.